So you want to venture out and try something new with your nails, that’s great, but where do you start? Selecting a design can be hard with all the variety available…and then what colours to use? Well that’s a whole new story for another time. One place to start is the classic polka dot. I have sifted through the million designs available and compiled a list of polka dot inspiration for the nail art novice. But ultimately anything goes! They are your nails and you can be as creative as you like. 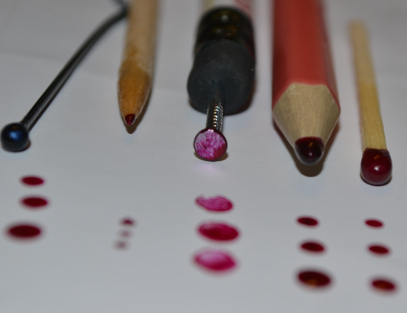 If you plan on honing your nail art skills, it’s a good idea to invest in some dotting tools. They are quite cheap and come in various sizes. However, for the nail art novice there are some simple DIY alternatives, not to mention the trusty bobby pin. Invest in a good quality base coat and top coat. You have slaved away creating your designs so you want them to last and look like a masterpiece as long as possible, right? Putting a clear top coat every couple of days helps your manicure last that little bit longer. 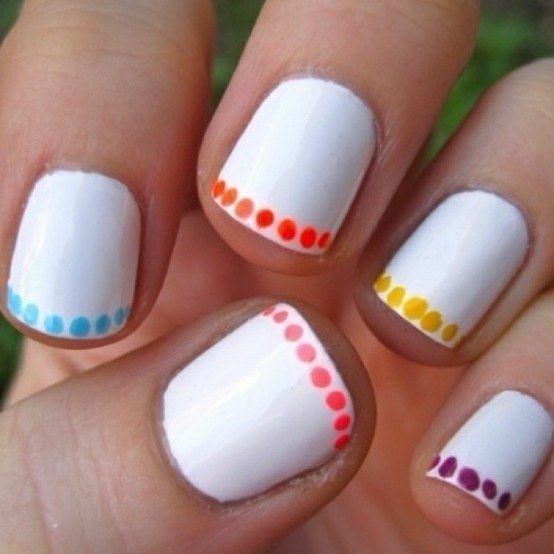 Dip the tip of your dotting tool into your nail polish colour and lightly place a dot on your nail. Repeat until desired pattern is complete. After you’ve mastered the one feature nail and know the right quantity of nail polish to have on your bobby pin or dotting tool, you can venture into having a mix of big dots and little dots. If you only have the one tool, experiment with different amounts of nail polish and having a lighter touch for smaller dots. Otherwise, go back to the DIY tools and find one that will give you a nice size comparison. Here are a few easy to achieve designs that are quite different but use the same simple technique. A mix of big and small dots add a creative flair. Source: 1, 2, 3, 4. The classic French manicure is so last season. 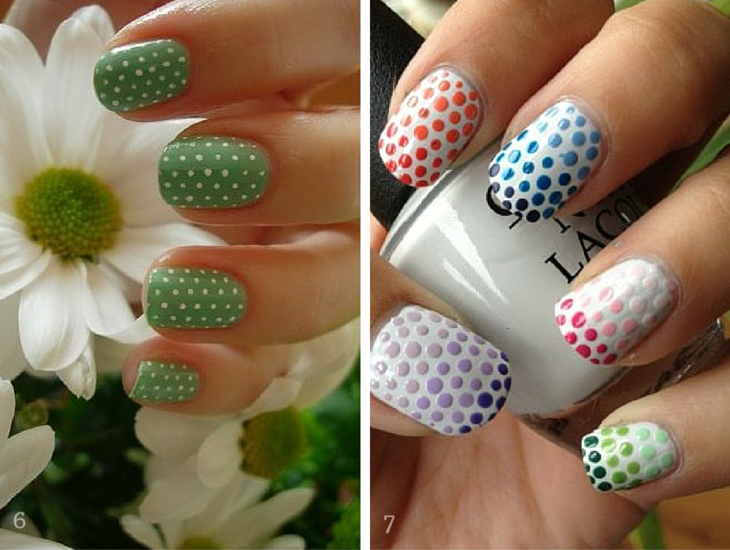 Try painting a line of polka dots along the tip of your nails to create a funky new look. Your colour selection is endless. You seem to be confident in your dotting technique now, so let’s expand on that. Creating consistently sized and spaced polka dots is a little more difficult, especially when using your non dominant hand. Take it slow and concentrate – no distractions here. The outcome is quite spottingly stunning. Take ombre to the next level by laying out your spots with a gradient of colour. Let’s face it, all girls own many similar-but-slightly-different shades of nail polish, so why not use them all at once? Consistency is key to make these looks work. Source 6, 7. You are not limited to just your finger nails, your toes could use a bit of fun polka dots too. Now that you are an expert, here is a video tutorial for three designs that are surprisingly simple and yet achieve an expert look. Are there any nail art techniques you would like to see next? Let us know in the comments. Posted on March 4, 2015 March 10, 2015 Author SamanthaCategories Beauty, Style by CatchTags How to do nail polish, How To Do Rainbow Nails in Water!, Nail Polish Tutorial, OPI, OPI Colours, OPI Nail Polish, OPI Names, Rainbow Nail Polish Tutorial, Which Nail Polish ColourLeave a comment on OPI Colour Wheel – How To Paint Rainbow Nails in Water!